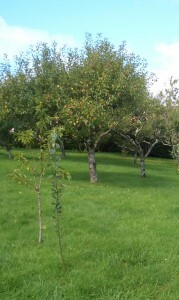 I have fallen in love with orchards. I have been studying their ecology and management in books on these cold wintery evenings and have also taken the East of England Apple and Orchard Project’s day courses on how to rescue, recover, formative prune and create orchards. The courses have been brilliant – even when the weather has tried to put us off with freezing-cold downpours. I am now practicing my new found skills on all the trees I can find and visiting trees and orchards just to absorb their ways. I thought this foreword to the “Community Orchards Handbook” (published by Common Ground) should be spread far and wide. “In orchards of tall trees we have achieved an exemplary relationship with the world, one that is mutually beneficial and life-enhancing. Orchards demonstrate how we should live with nature, as a friend and collaborator”.